A big thanks to Pam Smith from our CBD for Dogs and Cats Facebook group for this delicious recipe! Add parchment paper to a baking sheet. In a bowl, add peanut butter, pumpkin, cinnamon, turmeric, honey, pepper & coconut oil; mix until incorporated. Add the oats & mix well. If the consistency seems to wet add a pinch more oats. Grab a chunk of the batter & roll into balls (I use a melon ball scoop.) Place on prepared baking sheet. Do the same until no more batter remains. Place the baking sheet in the fridge to let the balls harden a bit then store in the refrigerator in an airtight container for up to 2 weeks or place in the freezer for up to 3 months. 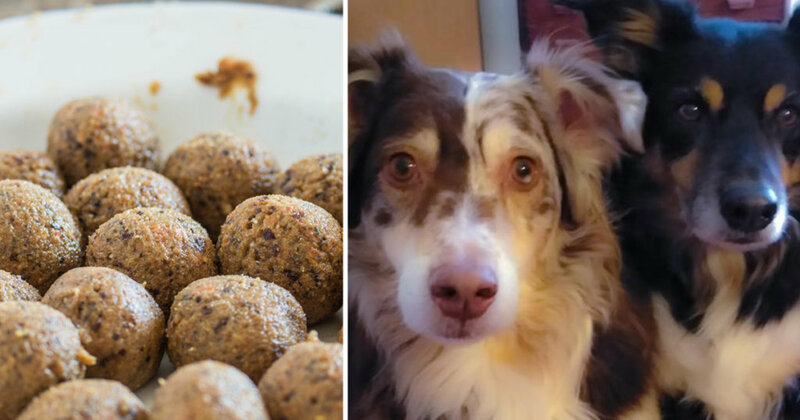 For the most consistent dose, add the CBD oil directly from dropper into each ball before giving to your dog. A few notes from the Cannanine team: We love that these treats are “no bake”, as cooking may lesson the potency of your CBD oil. As noted above, be sure to use a peanut butter that contains no xylitol, which can be deadly to dogs. Xylitol is a sweeter often found in low calorie peanut butters.